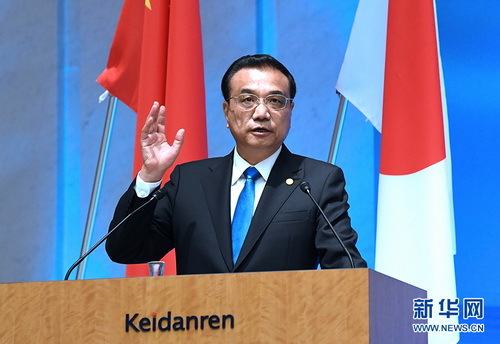 At noon of May 9, 2018 local time, Premier Li Keqiang, Prime Minister Shinzo Abe of Japan and President Moon Jae-in of the Republic of Korea (ROK) jointly attended the 6th China-Japan-ROK Business Summit at the conference hall of Nippon Keidanren in Tokyo and delivered a speech. Li Keqiang expressed that China, Japan and the ROK are neighboring countries across the sea as well as major economies in the world with important influence. Trilateral cooperation in economy and trade has strong resilience and vitality with broad prospects for win-win cooperation. At present, the economies of the three countries all show a sound development momentum. The resumption of the leaders' meeting of the three countries after a hiatus of two and a half years does not come easily and should be cherished. We should endeavor to create a peaceful and stable environment for development, stick to the path of peaceful development, respect each other's core interests and major concerns, and properly handle sensitive issues and disputes. The three countries should jointly push forward economic globalization and safeguard free trade. China, Japan and the ROK are all beneficiaries and supporters of economic globalization with the experience of being under the pressure of trade protectionism. Faced with the severe situation of rising protectionism and unilateralism at present, China, Japan and the ROK should firmly stand together to support free trade and jointly safeguard rules-based multilateral trade system. The three countries should accelerate the process of negotiation on the China-Japan-ROK free trade agreement and commit to pushing for an agreement on the Regional Comprehensive Economic Partnership at an early date so as to jointly promote the building of East Asia economic community. The three countries should expand investment and cooperation in production capacity. The three countries have respective advantages and share broad prospects for cooperation. The Belt and Road Initiative is opening up new space for trilateral cooperation. We support enterprises in following the market-oriented principle, giving play to complementary advantages, avoiding vicious competition, carrying out cooperation in "China-Japan-ROK+X" mode, as well as jointly exploring the fourth-party and multiple-party markets at large. The three countries should strengthen cooperation in innovation and people-to-people and cultural engagement. China is willing to work with Japan and the ROK to enhance cooperation in such areas as digital economy, artificial intelligence, environment protection, and medical and healthcare, so as to benefit the people of various countries and push for the realization of new prosperity of Asia. Li Keqiang stressed that over the past five years, China's economy has realized an annual growth of 7.1 percent, contributing to over 30 percent of world economic growth on a yearly basis. The achievements of China's economic development benefit from our vigorous promotion of reform and opening up. Not long ago, President Xi Jinping sent a clear message to the world that China will unswervingly expand opening up at Boao Forum for Asia Annual Conference 2018, and China will open its door wider. We will continuously optimize business environment and achieve high-quality development through the deepening of reform and high-level opening up. The year 2019 marks the 20th anniversary of the launch of the China-Japan-ROK cooperation mechanism. I expect the friends in the business circles of the three countries to join hands to not only benefit the three countries, but also provide the world with new engine of development and source of driving force. Shinzo Abe stated that the leaders' meeting of the three countries has reached consensus on opening up a new starting point for Japan-China-ROK cooperation, thus opening up new opportunities for economic development and mutually beneficial cooperation for the three countries. Cooperation in economic circle is an important engine driving the development of trilateral relations forward. It is hoped that the three sides will increase personnel exchanges and propel cooperation in such areas as finance, science and technology as well as coping with ageing population, in a bid to jointly boost the economic development of the three countries, promote the development vitality of Asia and play a positive role in leading the development of the world economy. Moon Jae-in noted that currently, new and important turn for peace occurs on the Korean Peninsula, which will bring more opportunities for business circles to invest and start business. It is hoped that the three countries will reinforce cooperation in such areas as joint research and development, energy, medical service, environment protection and disaster resistance and achieve substantial results, so that the people of the three countries will truly feel the well-being brought by trilateral cooperation. The three sides should take the Olympic Games held by the three countries in succession as an opportunity to strengthen people-to-people and cultural exchanges in culture and sports and showcase the peace and prosperity of Northeast Asia to the world. Over 200 representatives of the business circles and governments of the three countries attended the summit. Wang Yi and He Lifeng attended the event.